Confab time! Let’s make some magic here. This is a Money Duck. It’s soap. My sense is this is an object with a lot of potential for a math teacher. I’d like to know how you’d harness that potential. Over the next few days I’ll update this post with comments I’ve solicited in advance from some of my favorite curriculum designers. I’d love to add your thoughts to the pile. I’d be more interested in having students be sellers rather than buyers. Buyers’ incentives seem more qualitative: soap quality, residue, allergy, shape, smell. Being sellers, students could do a lot with cost analysis given production constraints. Show the picture. It’d be cool to have time lapsed video of soap breaking down under a shower stream or, to not waste water, one could actually document soap usage over time. Ask students how much they’d be willing to buy it for. Students are now sellers of the soap. How much should they price it knowing what people are willing to pay? Give constraints: cost of raw material, time to make, number of workers, etc. If 5,000 bars were made, what is the distribution of the bills in them? What about 106 bars? Thinking about it, I would position the student as the seller of the money duck for two main reasons. Ultimately, knowledge of the quantities of each denomination would be needed by both the seller and buyer. Unfortunately, the buyer would most likely never have access to that information (since I assume that it is not like a lottery where they divulge the odds of winning) and would have to guess whereas the seller could reasonably have that information. The seller thinks: profit + cost of “real money” + production cost. The buyer thinks: amount buyer would regularly pay for soap + amount of money buyer could win + amount buyer would pay for the novelty of having a money duck soap – minus whatever margin they are hoping to profit. I think that the seller’s situation is much more manageable. We can have Act Two information to determine the profit and production cost. The math will come from determining the cost of the “real money.” As for the buyer, there are many assumptions that will not fall as conveniently into Act 2. There may be disagreement as to what a buyer would pay for soap, the novelty cost, and profit margins. Accordingly, I think it is much easier to do the seller situation. My favorite question here would be to set a price for the duck and ask the seller’s question, what distribution should I use for the bills? But only after the kids have determined that an equal distribution is profitable for the buyer. My thought is that the kids will gravitate to the “Should I buy it” question, and the real learning comes from shifting them around to the sellers side of the problem. I’d set up many sets of two types of groups, producers (sellers) and consumers (buyers). The producers would determine what distribution of the bills (ha) go in the ducks and then set a price based on that info. They make up 20 “ducks” with their distribution. The consumers would go up to a producer and be given the odds of each type of bill and the price of the duck. It’d be up to them if they’d like to buy that groups ducks. 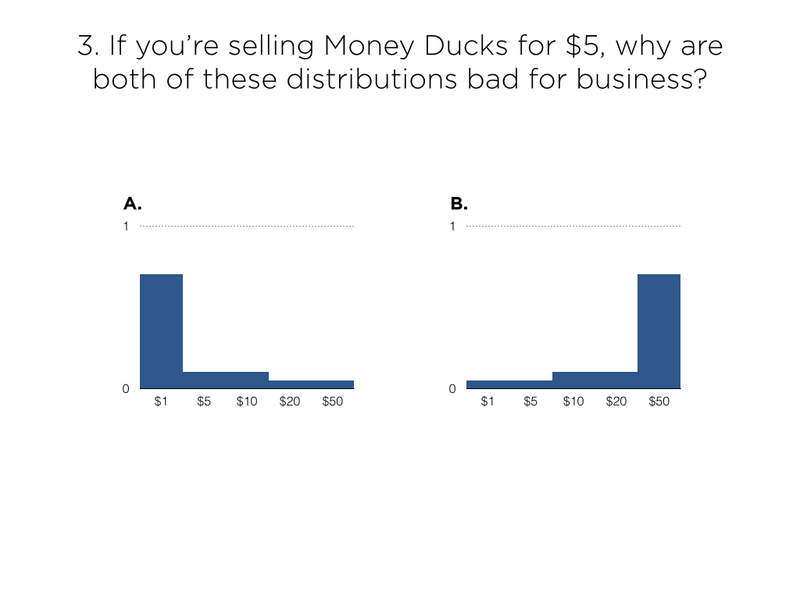 how about using the money duck to construct a survey. 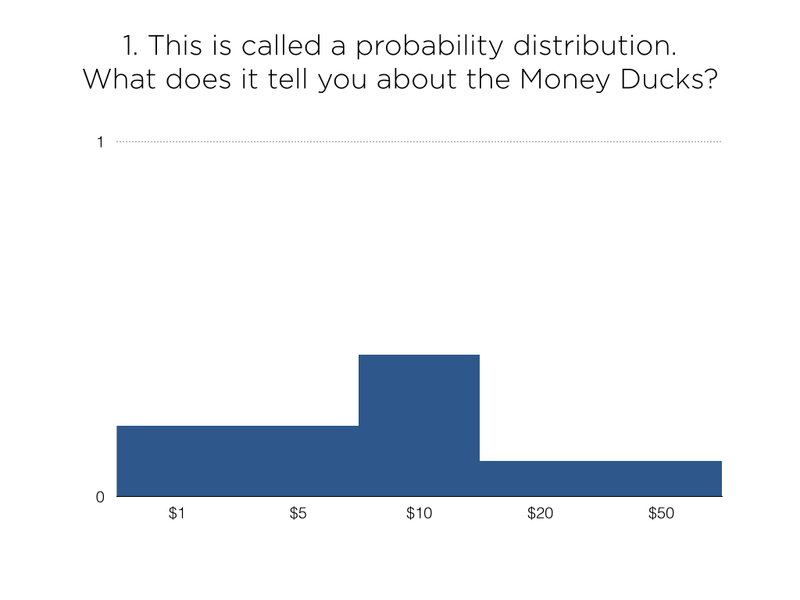 Survey students as to what odds (probability) of winning any prize would encourage them to muy multiple money ducks. I presented the Money Duck to my grade 4/5 class this morning with the question: “What is the most that you would pay for a Money Duck bar of soap?” Group conversations were animated as was the class discussion. 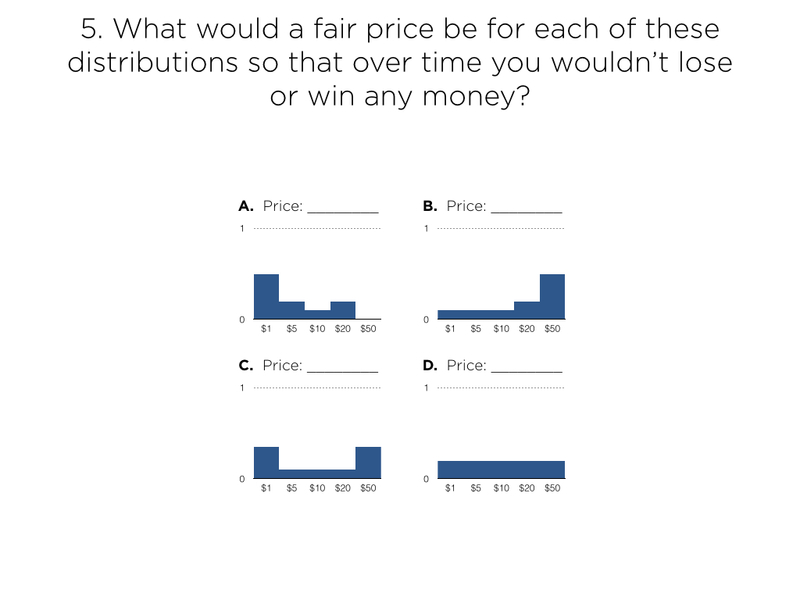 Questions that students raised included: “How likely would it be for the package to have 10, 20 or 50 dollars?”, “Is the money planted in the middle of the soap? If so, would someone break the soap to get at the money?” [in which case the soap didn’t matter at all in the pricing] and “What is the quality of the soap?” [If it was a good quality soap many were willing to pay more]. Some students started taking the seller’s point of view and gave ideas how they could increase profits. The discussion lasted nearly half an hour. Incidentally, the average price the students were willing to pay was $5. (Figuring that the soap itself was worth 3 or 4 dollars, and then factoring in the minimum prize of 1 dollar). Clearly this idea has potential at multiple grade levels. 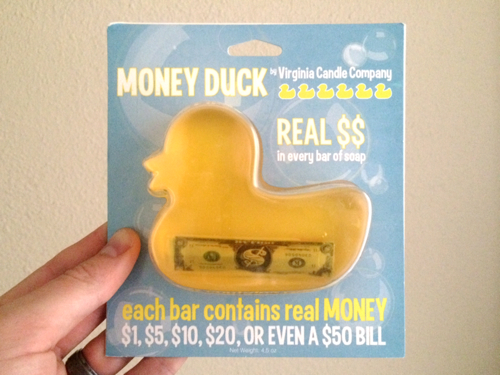 How many money ducks would I have to buy to be guaranteed to score at least one duck with a $50 bill inside? From what I’ve heard, nearly all of the ducks are $1 ducks. It’s like buying a lottery ticket — you expect to lose, but it can be fun for some people anyway. I think legally they only need to have one duck in the entire country that has a $50 in it to claim there could be a $50, so that’s likely your odds. Ask students to tell their neighbor how much they’d be willing to pay for the Money Duck. Find the high and low in the class. 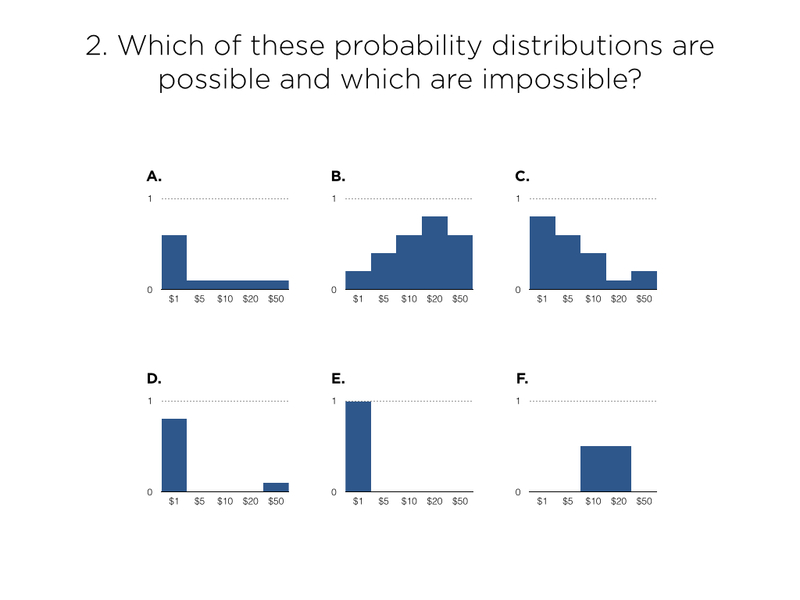 What is a probability distribution and how do we represent it? What does an impossible probability distribution look like? Why is it impossible? If you’re a seller, what kind of probability distribution is bad for business and why? I’m trying to progressively formalize a) this new, strange representation of probability and b) the calculation of expected value. So explain how mathematicians calculate the expected value of a distribution. 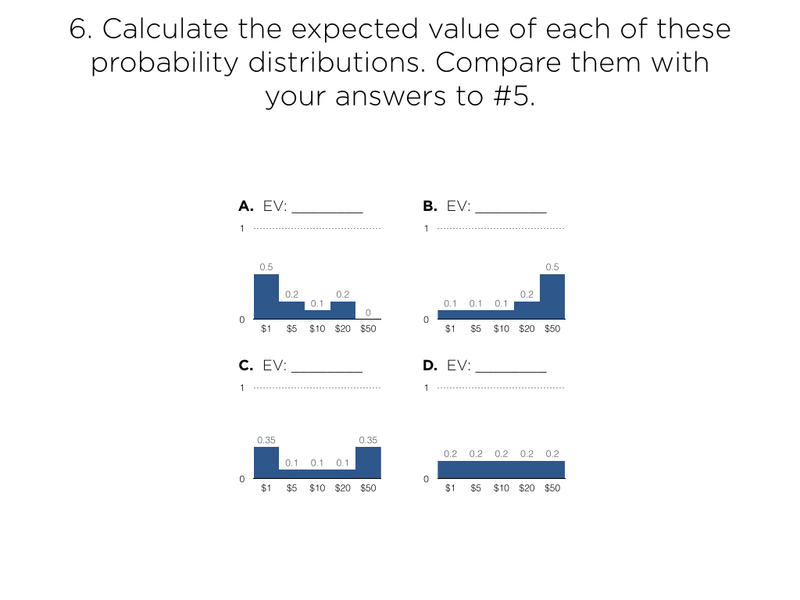 Now let’s go back and calculate the exact expected value of the distributions in #5. Here are those questions and screens packaged as a Keynote slideshow (also PowerPoint, if you must) and as a handout. Now let’s show them the answer, what the Virginia Candle Company actually charges for the Money Duck. Now every student should create a distribution that results in some profit at this price over time. Follow on with practice and assessment. What would you change, add, or subtract from this sequence? I was invited to give a few remarks to some newly minted math teachers at San Francisco State University last night. I had two things to say. Hi there. It’s nice to be here with you as you get kicked out of the nest. It’s an honor, in fact. I’ve met a few of you. Smart, thoughtful people each one. And it makes my decision to become a math educator seem smarter that you would make the same call. That’s real. I’d like to say two things briefly about what happens next and then I’ll be done. I’ll quote the first from someone I met a few weeks ago in New Orleans. He said to me, “Your first year teaching is about growing as a teacher, sure, but it’s mainly about getting to know yourself.” That’s wise. You go through life looking for mirrors. Literal mirrors at first and then figurative mirrors. Surfaces that reflect at different angles revealing more and more about your appearance and your character. At a certain point, a lot of us try to position those mirrors so that they reflect back only our best angles. The most valuable people in my life refuse to let me position them. My best friends notify me of my worst angles and refuse to accept them. Here’s the second. It’s tempting to compare the job of teaching to other jobs you could have taken, jobs your college classmates took, jobs taken by the people you grew up with. I struggled with this for a long time. Friends of mine made more money working fewer hours and their profession wasn’t ever ripped a new one on national television. (Except for the ones who went into financial services. I dodged a bullet there.) Overall, that wore on me. I asked around about med school prereqs. I filled out an application for film school here at SFSU. In case you ever feel the same way, here are two helpful ways to look at the job of teaching. The first is that you don’t have to worry, as many of my friends still do, that their jobs don’t really matter to anybody except the family they feed. You don’t have to worry that you’re insignificant to other people. You’re in the profession of developing humanity, one class at a time. That’s no small credit you get to claim. I can’t imagine how hard it would be to doubt your job’s value to humanity for thirty or forty years. The other reason to love teaching when people try to convince you not to is that teaching has the best questions. Me, I came to realize that past a certain baseline income, what I need most in my life are good questions. Questions that aren’t so small they crack easily. Questions that aren’t so big – like rising inequality or climate change – they put me in a fetal crouch. I need questions between those two. Questions at just the right size. Questions that crack after weeks and months not hours. Questions I can roll around in my head on long road trips or standing in line at the DMV or in some boring lecture. Lately I’m in the market for a ten-year question. Something that’ll take me through my thirties. I know I’ll find it in teaching. See, there’s profit in answering a good question. The profit isn’t cash. The profit isn’t even answers. The profit is more questions. The best questions yield more questions once they’re answered. And teaching has all of them. For me, teaching has all the best questions. And most of them are timeless. Questions about human learning will endure even after questions about typesetting and carriage manufacture and driverless cars have expired. You’ve signed onto a job that’ll yield the best version of yourself, one that offers you endlessly fascinating questions and the growing awareness that a lot of little people’s lives would be less without you. I couldn’t be happier for you and I couldn’t be happier for myself that I get to count you all as colleagues. 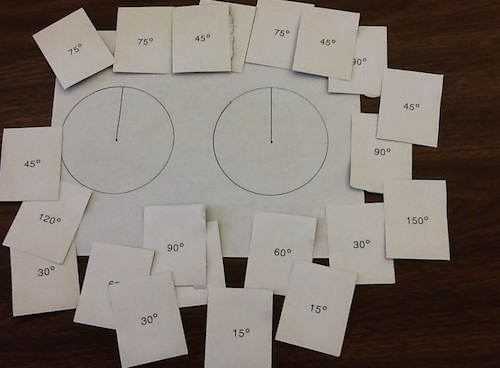 The game consists of two circles (the pies) and a set of Angle Race cards. Partners take turns drawing a card and then using a protractor to measure off the right sized piece. Keep going until you’ve eaten your entire pie. Whoever finishes the pie first is the winner! Joe improvises his lesson plan in two very interesting ways and he explains his thinking. That’s great blogging. Will any of them have to do this in the “real-world?” Who knows? Maybe, maybe not. But the pictures and slides set into motion a new enthusiasm about solving it because it was their school, it was their gym. It was something they know like the back of their hand. Maybe next time they’ll look up at the ceiling and remember how they figured out the area. Kaleb Allinson and Sarah Hagan offer different but useful approaches to probability. I will have students make their own boards using geometric shapes that will convince someone to think they can win but that odds are still in the game owners favor. As an extension students can include winning different amounts of money depending on where you land so a player is more enticed to play. I’m quoted this week in a piece by Vox’s Libby Nelson on the Common Core State Standards. This reminded me to empty out my collection of podcasts, vodcasts, and press clippings, for the benefit of my doting mother if nobody else. The Ontario Ministry of Education interviewed some of my favorite math educators, including Cathy Bruce and Marian Small. They gave me four segments there to talk about engagement, classroom culture, and applied mathematics. Some teachers visiting from Catalonia interviewed me about three-act mathematical modeling. The Boston Globe quoted me in a lifestyle piece on efficient holiday shopping. Remarkable Chatter is a podcast based in Hutchison, Kansas. Earlier this year we talked about the difficulties of changing practice. Adrian Pumphrey’s MathEd Out podcast is in its infancy but he asks a lot of provocative questions. I’m the interview subject in his second episode. I caught Motion Math’s latest game at their booth at NCTM. It’s pretty irresistible. Kids are in the pizza business. They get to name their pizzas whatever they want, create them with whatever ingredients they want, and sell them for whatever price they want. Then the game goes all Sim-like on the kid. Customers come in and start buying up pizzas. The student practices multiplication at the cash register. Eventually the day is done and the student tallies up her profit or loss. The game builds in just enough market behavior to make it a fun introduction to running your own business but not so much market behavior you’re collecting W-9s from your employees or dealing with health inspectors. Customers get annoyed if you price your pizzas too high. You run out of pizzas if you price them too low. They request new ingredients, which you can go buy at the market. It’s great math and great gameplay from one of my favorite game designers in math education. Highly recommended. Thanks to the suggestion from @ddmeyer my daughter, my son, AND my wife have been playing Motion Math: Pizza! nonstop since yesterday. This game is terrific, with plenty of variety and thoughtful math. There’s even work on unit rates available when a second vendor opens, and one is offering 20 sardines for $4 while the other offers 90 sardines for $20.